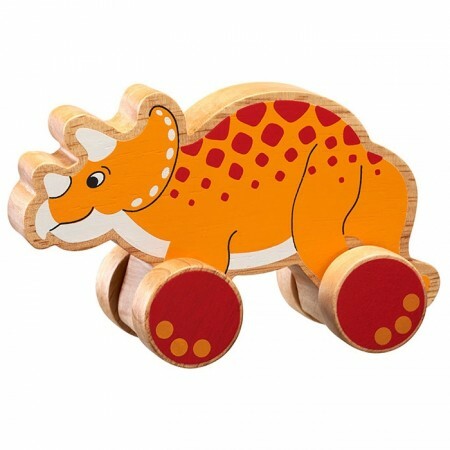 This Lanka Kade Push Along Triceratops is a fun dinosaur pushing toy for tots with a colourful orange design, red markings and threatening horns on each side. 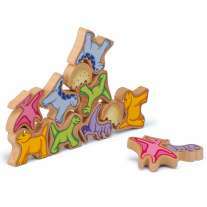 This wooden dino toy looks great and has top eco credentials too. 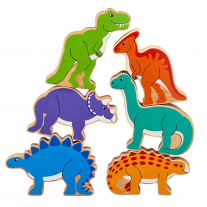 This fair trade toy dinosaur has a colourful painted design on both sides with natural edges to show off the wooden grain. 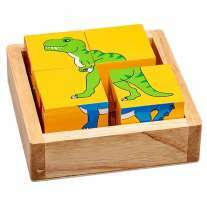 Pushing this wooden toy dinosaur along the floor teaches tots about movement, speed and force. This eco toy is fun to play with on its own, while siblings and pals will also enjoy racing push along animals across the floor. 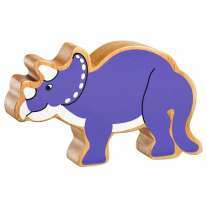 Suitable from 10 months, this triceratops makes a great first birthday present or a gift for baby's first Christmas. Ethically made with sustainable rubber wood, this traditional push along toy will be a hit with tots and green parents alike. This toy measures 8.9 x 14.6 x 5.8cm. Schematic play: trajectory schema. Sensory toy: gross motor skills, grip, control.